In her debut collection of short fiction, Unruly Creatures, Jennifer Caloyeras explores identity, escapism, isolation, and various forms of intimacy. The eleven stories within the collection read as stand alone pieces. There is, however, a thematic thread connecting the lives of each characters; each yearns for some kind of escape, some kind of inclusion or intimacy. Whether that escape be from the trapping of their body or their lives, their love or the lack of, each individual character struggles with their unique reality. The stories themselves maneuver stylistically from realism to magical realism to social satire, yet the feeling of being trapped is always present, and Caloyeras sets out to ensure that the readers feel just as trapped as the characters do. It is a rare and welcomed journey to embark on when reading Unruly Creatures. Caloyeras invites us to laugh at the absurd while simultaneously questioning what it is exactly we know about our lives. Unruly Creatures begins with the line “Things were getting weird in the gorilla habitat” (1). With this, Caloyeras opens the door and invites us in to her own habitat where things are not what they seem to be. Though some of the stories do take place within confined spaces or habitats, such as “The Sound of an Infinite Gesture,” “Airborne,” “Roadkill,” and “The Dolphinarium,” Caloyeras’ power comes across in the stories in which the barriers of the outer world are removed. Often, the characters who have some freedom in the outside world are trapped—or alienated—by the nature of their lives. Others, in a few more bizarre stories (“A Real Live Baby”), seek refuge in surrogacy. There is a diversity to this collection that is narrowed, placed into the intimate confides of similitude through the related feelings and thoughts persistent in the collection. The characters in Caloyeras’ stories shy away from direct human connectivity and, instead, choose an indirect form of intimacy, whether it be a gorilla or a baby doll. In a way, it a critique on how distant society has become from the individual. In “Plush,” a son is distant from his father: “We reach for the syrup at the same time. I inadvertently grasp his hand, which is wrapped around the neck of the plastic bottle. His skin is cold: what you’d expect from a man who spends all day placing them in sub-zero temperatures. It’s the first body contact we’ve had since I can remember. I quickly let go. He was there first” (75). The physical contact between the two is jarring. The son retreats, summarizing the experience as a “first come, first serve” experience, but there is more to it than that. Caloyeras wants to draw attention to these minor lapses. Later, the son hugs the father while wearing a costume, only the father does not know it is the son. 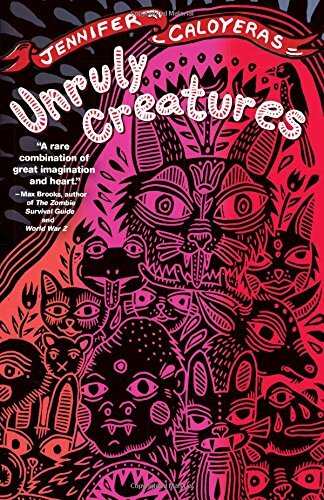 Unruly Creatures is almost wholly devoid of immediate intimacy between characters. The episodes when intimacy is present, it is expressed, as previously mentioned, through the inhuman characters. It gestures towards the question of what is genuine and what is artifice in out lives. In the end, it is the exploration of intimacy, the desire to escape one’s reality, one’s body, and personal identity that drives and connects Caloyeras’ stories. Coming-to-age or adult, each individual is faced with questioning their own lives, and the reasons for certain occurrences. It is about how we cope with each occurrence that sets us apart from one another. If we step back and observe our lives, there may be more to it than we give credit to, and more hope than we may feel. It is the oddities, the uniqueness that brings us closer to answers. As Caloyeras writes, “There’s no telling what she might discover when it’s examined at two hundred times original size” (158).